1. Online on the partner site musin.zp.ua. You can pick up tickets at the stadium ticket office or at any ticket office listed below. 2. Slavutych-Arena ticket office to be open on May 10, 11 and 14 from 10:00 to 18:00, on the match day - from 09:00 to 20:30. - sections 1, 2, 3, 4, 5, 9, 10, 11, 12 and 13 – UAH 60. 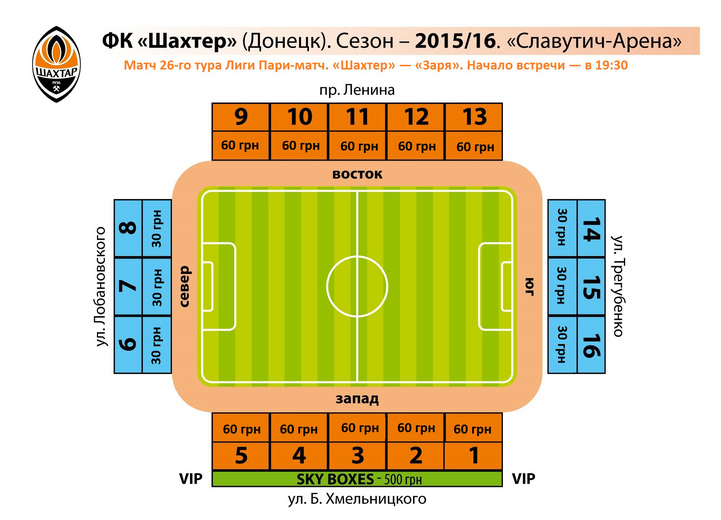 For more details please contact the FC Shakhtar information centre: 062 388 88 83.